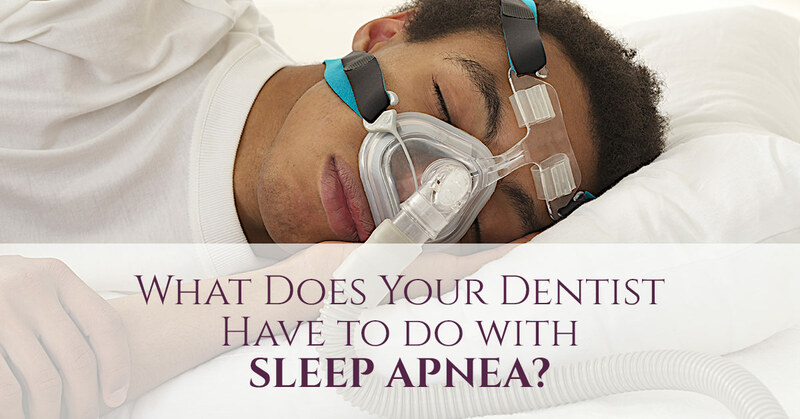 Dentist Lawrence:What Does Your Dentist Have to do With Sleep Apnea? What Does Your Dentist Have to do With Sleep Apnea? What do dentists have to do with sleep apnea? Sleep apnea is a sleep disorder that is characterized by breathing interruptions while you sleep. There are several kinds of sleep apnea, but obstructive sleep apnea is the most common, and many people have found relief with sleep apnea treatments prescribed by their dentists. However, we often get asked what role a dentist plays in sleep apnea. Your dentist may be able to spot the early signs of sleep apnea. Tooth grinding, or bruxism is often the first sign of sleep apnea. When you aren’t breathing as you should while sleeping because of obstructive sleep apnea, your body will often try to compensate for this restriction by pushing your lower jaw forward and grinding on your front teeth. Tooth grinding often leads to other oral issues as well, including wear on teeth, sensitivity to hot and cold and gum tissue recession. Tooth grinding isn’t the only red flag your dentist may be able to spot to alert you to sleep apnea. A tongue that has jagged edges, a small jaw or redness in the throat are all additional signs of sleep apnea. How do dentists treat apnea? The most common sleep apnea treatment is continuous positive airway pressure (CPAP) therapy. However, this therapy requires the use of a machine that continually pumps oxygen into your nose or mouth. Unfortunately, these machines can be very uncomfortable and difficult to get used to resulting in only about 50 percent of users actually being able to use them. The good news is that our dentist in Lawrence may be able to offer you a more comfortable alternative. At James Otten Dentistry, our dentist in Lawrence has helped many people find an effective alternative to CPAP therapy with a custom-made oral appliance. These appliances are designed to safely hold the jaw and tongue forward to open your airway. This allows you to take in air without significant restriction while you sleep. If you think you may have sleep apnea, don’t put off getting the treatment you need. Sleep apnea is very serious, and if left untreated, it can lead to many different health problems, including high blood pressure, stroke, heart problems and more. Regardless of whether you are looking for a more comfortable alternative to CPAP therapy or you think you may have sleep apnea, turn to James Otten Dentistry. Our dentist in Lawrence can help you determine if you have sleep apnea, as well as if our oral appliances are the right treatment option for your sleep apnea. Schedule your appointment with us online today!